I chose the American Beauty Julep Maven Box this month, again. This is Julep Maven's 1st birthday so there was a special message printed on the inside of the box and a free tote, too. This is everything included. This should give you an idea of the tote's size. Not quite grocery bag size, but a nice little re-useable shopping bag. I will use it, but I would get more use out of it if it were a bit bigger. I am most excited to try out this polish remover! It has a pump style cap that seems really handy. I am almost out of polish remover so this was perfect. I don't know yet if the remover is worth the $14 price tag ($11.20 for Mavens) But, even if it is not, I do plan on reusing this bottle. The description for Stefani is pretty spot on, but I consider Dakota a coppery bronze. What do you think? rose gold? Here are some quick swatches. 2 coats each with 1 coat of Out the Door top coat. I really like them both. I was worried about brushstrokes with this sort of finish, but I didn't have any problems with them at all! I can't wait to wear them as full manicures! Very pretty colors for Fall. Are you a Julep Maven? What did you get this month? Right now you can become a Julep Maven and get your first box for only a penny! Nail poish for 1¢? Yes, please! Just Click Here and enter COLORS4ONE at checkout. The links included are my referral links. When you sign up you get one, too and you can earn credits toward free maven boxes! The colors are so lovely! 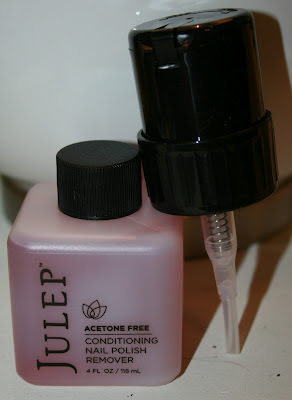 <3 Do you know if Julep Maven boxes are available in Canada? They are! But, as far as I know it is only available in the US and Canada. Beautiful polishes! I wish I could find a pump bottle for my polish remover!